My friend Erin asked me a few months ago if I wanted to be a part of her book tour. I knew that she was writing a book but I didn't really know much more than that. She sent me some photos of the projects for me to look over before I agreed. WOW! So many projects! As I was looking through the photos I kept thinking, "I need to make this, and this, and this, and this...." Of course I said that I would make something from her book! Choosing what to make for this post was really hard. Needless to say, you will most likely see more posts from me with projects from Sew Home. Before I show off the cute tablecloth I made, let me tell you why I love this book. First of all, Erin took a lot of time to explain different home decor fabrics and what to look for when choosing fabrics for your projects. If you are a complete beginner and looking for a way to start sewing, this is all good information. I even found some of this part of the book news to me. And I own a fabric store. There are 30+ projects in this book. For $25.95. That's less than $1/pattern. The projects range from tablecloths and napkins to drapes (and a guide to figuring out how the curtains will look on your wall)! This is kind of like a an encyclopedia for home decor projects. I really like that for things (like the tablecloth or curtains) that will have custom measurements, Erin provides easy math to figure out what you need to cut. She also includes standard sizes for things like the pillow shams (also on my to make list) that have set sizes. There are so many really great fabrics out there today and many of the designers are even printing on linens and canvas now. And a lot of the projects can be made with quilting weight cotton as well. Now to see the tablecloth! I have a square table at my shop (Pink Castle Fabrics) that we use for displays sometimes. It's a nice little thing from Ikea (I don't think they make it anymore) but it's kinda plain. Erin's tablecloth pattern in the book (photo from the book below) it perfect! It's quick and easy and I can change out the fabric easily if it goes out of print. So I can always have a cute and relevant tablecloth on our display table! The whole project took me about 30 minutes start to finish! I choose one of my favorite Cotton+Steel prints from Melody Miller's Fruit Dots collection, Fruit Blossoms in Navy. Really, this print in any of the colors would make lovely tablecloths or napkins. I also was pretty excited to get to use the serger at the shop for this project. It gives the tablecloth a professionally finished look. I used Aurifil 50 wt thread from my One Room Schoolhouse thread box (Melody and I both have a really great sense of color :D ) to edge stitch the hem. I like the contrasting thread and the way it looks. Pretty cute right?? Now you want to make one too, don't you! Thanks Erin for inviting me to be a part of your book tour. I really think you did a fabulous job and I know I'm going to be referencing this book for years to come. Cute tablecloth! This looks like a really good resource book!!! Thanks for the chance! That looks like fun! Maybe it would force me to try my new Serger!! Can't go wrong with Cotton&Steel! Looks fantastic!! I have been wanting to make a fall tablecloth with some beautiful fabric that recently jumped into my cart! I need to sew a lot of things for my house. This might motivate me. Can't wait to get a copy of this book! I put it on my wishlist, so hopefully I hubby will buy it soon! ;) Love your tablecloth! I also need to make curtains and pillow covers. Don't you love a book that is so well-written that you can follow its directions and end up with a project that makes you feel like you are more competent than you (secretly know you truly) are? Sounds like a go-to book. I love making things for my home. The fabrics just cheer you up and inspire you to make more beautiful items. Thank you for putting together the book and offering a give-away. super cute! looks like a great way to get others into sewing too :) Thank you for the chance to win the book!! Can't wait to see you at market! Wow, sounds like a great book to inspire me to make some home projects. Maybe it will get me to dust off my serger, too. Very cute tablecloth! I think I need this book! 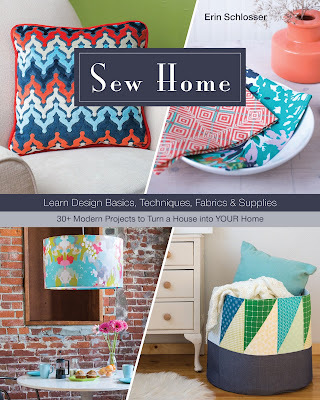 I really enjoy sewing home décor items and would love to browse this book for more ideas. The information such as choosing fabrics and measurements would be very helpful! I love your tablecloth and you are right I want to make one for myself. I really need this book it seems like it would have some great projects. Of course I want to make a tablecloth... and just like yours! The fabric is so nice and my table is similar size. What good ideas to get a more customized look all over the house. Lovely tablecloth! I'd love to make a few items. Some pillows for the couch as well as curtains for the bedroom. Thanks for a chance to win. Fingers crossed! And when that fabric goes out of print, you can repurpose the tablecloth and use the fabric again in another project down the road. I'm assuming a serger is not required for the tablecloth. Take care, Mary. Yeah to the tablecloth, sure would love this book, love sewing. Beautiful table cloth! I love using Cotton + Steel fabric for everything! I love having cute place mats for every season. Thanks! Pretty tablecloth! Looks like a great book. Definitely want to make tablecloth for my new kitchen! Love the fabric you chose! Thanks for the chance to win! I'd love to peruse this book to see what's best to make for my new sewing room. It's exciting to decorate my new space.